If you don't know already, the scientists at DARPA are obsessed with extracting energy from insects. 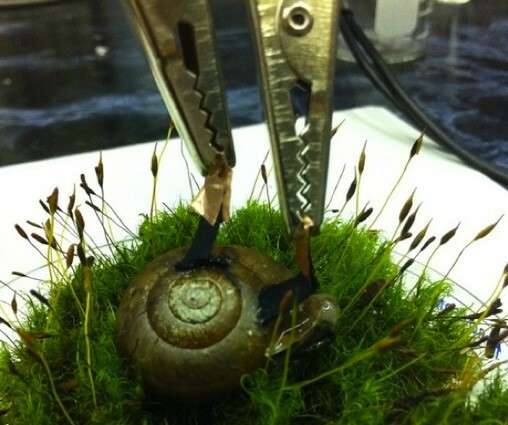 A team from Clarkson University, New York and Ben-Gurion University, Israel has gone one better by turning a Snail into a cybernetic power generator. A pair of Buckypaper electrodes were charged by the electro-chemical reactions in the slow-moving invertebrates "hemolymph," its equivalent to blood. Its hoped the Snails will provide a sustainable way to power listening devices for the Department of Homeland Security, so if you suddenly find your crawlspace full of gastropods, be careful what you say.